Abu Dhabi, the capital city of United Arab Emirates has always lived under the shadow of its sister city, Dubai. However, today, it is turning into a major tourist hub with an array of attractions and outdoor activities. Like any other tourist city, the emirate blooms during certain seasons of the year. The right time to visit is from November to February when Abu Dhabi is on its best behavior. The cool weather encourages outdoor activities like desert safari, visit to nearby islands and beach bumming. The outside temperature usually ranges from 9 to 25 degree Celsius. While the mornings are pleasant for a leisurely walk, do not forget to bring in warm clothes. It can get quite chilly at night when temperatures dip to freezing. You can also buy winter wear at the shopping malls that are displaying great autumn-winter collections. In fact, serious winter sales are organized during December though not all stores have them. In January-February, the annual Dubai Shopping Festival (DSF) attracts many tourists from abroad who come to receive great discounts on branded goods, exotic products and local handicrafts. Abu Dhabi tries to keep up with the pace by offering discounts during the same period. Wherever possible visit the shops during the first week of the festival to get goods. However, in the last week of the sales, the shops further reduce the discounts to 50-70%, which makes it possible to get grand discounts. Here are the five popular tourist attractions in the capital of United Arab Emirates that offer something to suit every taste. Corniche dresses up Abu Dhabi in the most fanciful patterns for a city that is so boringly adorned with concrete towers. Livening up the city’s waterfront area, the Corniche is a jewel in the crown of Abu Dhabi with it neatly laden pavements, cycling paths, separate playing areas for children and a Blue Flag beach. Trimming the city’s borders from Hilton Hotel until Al Khaleej Al Arabi Street, the Corniche salutes traditional values with separate sections for families, singles and public. While the entry to family and single beaches is charged, entry to the public beach is free. If you want to soak in the panoramic horizon of Abu Dhabi, hire a bicycle and enjoy the pedaling power on special cycle paths. Worshippers know no bounds when it comes to dedicating a shrine to their beloved God. 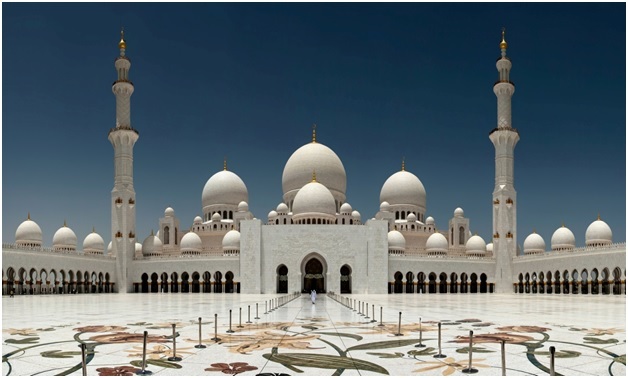 Sheikh Zayed Grand Mosque, built in remembrance of HH Sheikh Zayed bin Sultan Al Nahyan, reflects the splendour and grandeur of UAE’s Islamic architectural styles. It marks the first and largest of many features such as the world’s third largest chandelier and world’s largest Persian carpet. The interiors of the mosque shine in the resplendent Swarovski crystals, glorious pools and columns carved with unique calligraphy styles. The thrilling, bizarre adrenaline pumping through our veins is an enough reason to visit Ferrari World on Yas Island, Abu Dhabi. It is the first and largest Ferrari Park in the world mapping the story of car giant through the decades. Kids, teenagers, and adults; there is something for everyone to do, right from interactive 4D adventures to the spine-tingling G-Force. Abu Dhabi’s iconic landmark, Emirates Palace truly epitomizes luxury and brilliance. The palace, which is the second most expensive hotel ever built, spans over 100 hectares and features 114 domes, 1,002 chandeliers and two handmade carpets each weighing a tone. There is a glaze of opulence in every visible part of the hotel as gold, mother of pearl and crystals dominate the interior. Heritage Village reflects the past of Abu Dhabi when it was just a small village occupied by the local Bedouins. It is interesting to know how the Bedouins lived, fended for themselves and worked around their traditional skills. Get a glimpse of their life at the campfire with coffee pots, goat’s hair tent, workshops of weaving and spinning and spice shops, which sell local herbs. Most of the Hotels in Abu Dhabi provide facility of a business center giving access to guests for uninterrupted internet service, international calling, photocopy machines, and Abu Dhabi car rental services. Stylish space together with prudent luxury and impeccable service renders a royal touch making the stay at the hotel an experience to remember. The guests have the option of selecting accommodation starting from standard rooms to the luxurious suites. Abu Dhabi hotels are the perfect choice for leisure and business travelers, seeking urban extravagance and distinctive standards of excellent service and hospitality. The warmth and hospitality offered is beyond the conventional. A unique blend of urban conglomeration and rich old traditions, Abu Dhabi is definitely a must visit city.